Boil 8 cups of water with 4 sheet of Kombu Sea Vegetable, reduce to simmer. 5 minutes later, take out the Kombu sheets, and slice them into ½ inch squares and return them to the simmering water. Take 8 Tbsp. of Miso paste into a bowl. Add some warm water and mix allowing it dissolve into a soupy consistency and add to the water mixture and stir. Cut the Tofu into 1 inch square cubes. Add to the miso soup mixture. Chop carrots, celery, scallions and add to miso soup mixture. If using fresh ginger and turmeric, chop very small and add to miso soup mixture. Last but not least, turn of the heat, add dill and lemon juice. 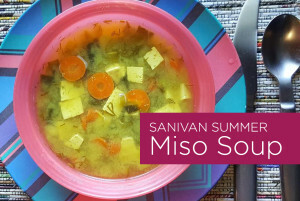 Enjoy a very healthy and hearty miso soup.